To my knowledge India is not a country known for its influences on the progressive metal scene, but maybe it’s time for some small changes. A band called Skyharbor from India decided to be a member of the growing "djentlemen’s club" (influenced by the polyrhythmic pioneers of metal Meshuggah). The mastermind behind this act is guitarist Keshav Dhar, and it took him almost 4 years to finish the double disc debut album “Blinding White Noise: Illusion & Chaos”. The release includes 10 tracks of which 7 made it to disc one (titled as Illusion), and the other three tracks to disc two (titled as Chaos). The bass man is Nikhil Rufus (Indigo Children) and the drumming sticks are handled by Anup Sastry (not on the record though, Keshav programmed the drums before adding Anup to his staff of musicians). With so many talented experimental technical prog bands (TesseracT, Periphery and Meshuggah just to name a few) out there, is Skyharbor able to distinguish themselves from the crowd? With the support from some well-known guest musicians, I actually think they nailed this debut pretty bloody well. Daniel Tompkins (ex-TesseracT) and his wingman Sunneith Revankar (Bhayanak Maut) are taking care of the vocal chords with clean, growling and screaming singing style. Marty Friedman (ex-Megadeth) and Visha J. Singh (Amogh Symphony) are the virtuosos, who contribute with amazing guitar tunes together with Keshav. Track number one “Dots” is a perfect start of the album, and sets the mood with some densely layered guitar tunes, that slowly gets heavier and more complex with the use of odd time signatures. The complex melodies and ambient playground is a trademark used throughout rest of the song and disc one. The vocal is handled sololy by Daniel Tompkins on disc one, and he impresses again with his control of clean, soaring and screaming singing style. Swapping out disc one with number two, is like moving from the peaceful eye of a hurricane to the thunderstorm clouds in the eyewall. It’s that violent and the title “Chaos” fits perfectly to disc number two. It guides you through three tracks of aggressive technical progressive metal. The brutal growl/scream from Revankar begins the show and opens up the gates to hell (Chaos). My only concern with disc two is the total running time of only 13.5 minutes. That's not enough time in hell to convince my metal brain. It’s easy to compare this band with the guys from TesseracT. Their music has a very similar melodic vibe with the odd technical guitar tunes added to it. The soaring haunting vocal and the extreme singing style from Daniel are almost identical to his previous work with TesseracT. Disc two on the other hand has a more aggressive extreme approach combined with strong complex song structures, and resembles those from US “djent” pioneers Periphery (but with much better vocals). Not saying that the band is a copycat. Is this just another “djent” band on the musical progressive scene? My answer is yes. 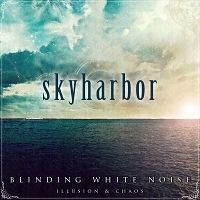 Skyharbor has no distinct, recognizable sound and the only uniqueness about the band, is that they come from India. If more aggressive songs of same high quality as the current ones were added to disc two, it would also have raised the score. Still I like them. I like them a lot. They are very good craftsmen and the complex melodic tunes on disc one and two, show us the impressive skills of the entire line-up. And the contrast between disc one and two is the thoughts of a genius. If you can answer yes to the question “Do you like technical, melodic, complex, atmospheric and aggressive metal in the same vein as TesseracT and Periphery?”. Don’t think twice. This album must be added to your shopping list.